Give out something blue at your bridal shower. Each of the Pretty Presents Mint Tins feature a simple colored background with a simple white ribbon design. The Pretty Presents Personalized Mint Tins measure approximately 5/8" x 1 /34" and includes 0.45 ounces of peppermints. The affordable Pretty Presents Mint Tin can be personalized with your party's theme and are a colorful accent to any table or are a great bridal shower favor! Assembly required. 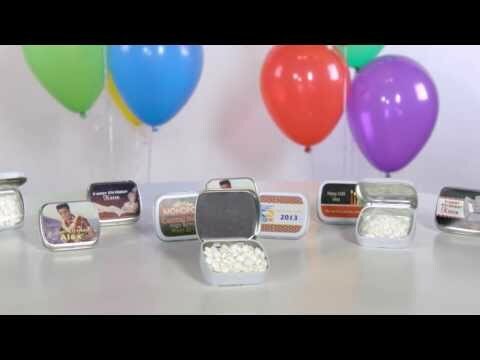 Your guests will love these Awards Night Mints. Each Hollywood Butter Mint is wrapped in assorted gold and black wrappers that feature a Hollywood icon. You'll get 50 of these 1" mints per package. Make your Hollywood Night special with matching butter mints. This Tea Party Lemonade Drink Mix features a colorful tea party design with flowers and stripes that is printed on a 2" white sticker. Each Tropical Sunset Lemonade Drink Mix packet measures 4 3/4" high x 3 3/4" wide and makes up 8 ounces. Assembly required.